Texas, like many other parts of the US, hasn’t gotten much rain this summer. That is, until yesterday! It poured for more than 10 hours yesterday in Dallas! Don’t you just love rainy Sundays? I certainly do. Especially when there’s an SVU marathon on! To celebrate, I thought I’d bring out my favorite rain boots by Sloosh. Aren’t they cute? Rainy weather meant cooler temps too, which I think we can all be happy about. Since we got a break from the heat, I also pulled out a new sale find of mine: this chevron Theory sweater. It’s super comfy, but fitted, which I love. It’s a great basic, so I know I’ll be wearing it all season long! You may remember I included these jeans in a recent EDIT. While I don’t usually like the look of camo, I am obsessed with these! The print is so subtle you almost can’t see it. These jeans are a good alternative to basic black skinnies, don’t you think? Speaking of James Jeans, they may just be my new favorite brand of denim. Remember these? Clearly I love the Twiggy fit, since I now have two pairs of this style. The Twiggy is a high-rise skinny, which is just the flattering fit my figure needs. Next on my list will be this coated pair – a little sleeker for a night out, don’t you agree? Also a fan of this scarlet pair of skinnies! Such a pretty shade for fall. Last but not least, I always love zipper-detailed denim. These are so awesome the print is so subtle, great rain-day look. Those rain boots are adorable. I love that thoughtful little ankle detail. It hasn’t rained much in Wisconsin either and I was just griping that the grass was starting to get crunchy. We could use a rainy day or two (preferably while I’m at work, of course!). I love a cozy, rainy day too once in a while! 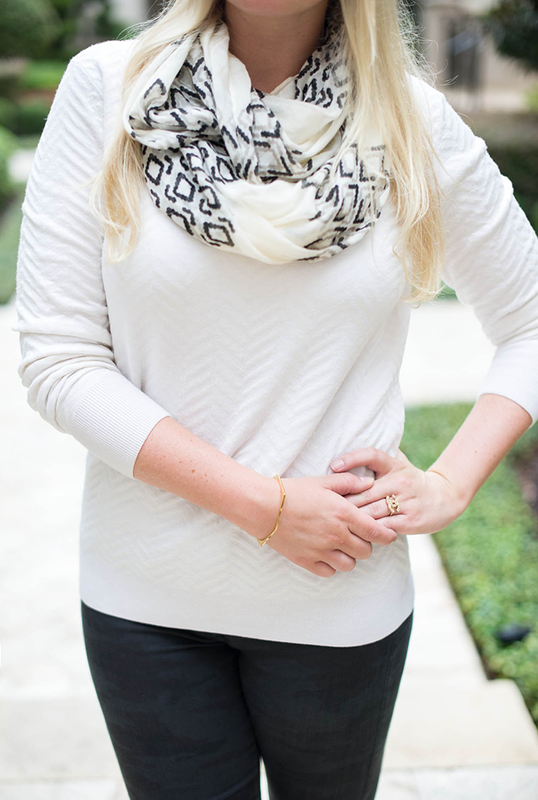 Your chevron sweater and scarf are classic, timeless pieces that I’m sure you’ll be wearing all season. And those Sloosh boots are so polished and sleek! While it’s not fall quite yet I’m counting this as a fall look that I LOVE! I would have never considered buying camo print jeans, but these are really cute! Yay! The photos turned out so cute. You look so pretty! PS- Loving all the different textures in your outfit. Camo jeans are so fun on you, they are stunning! 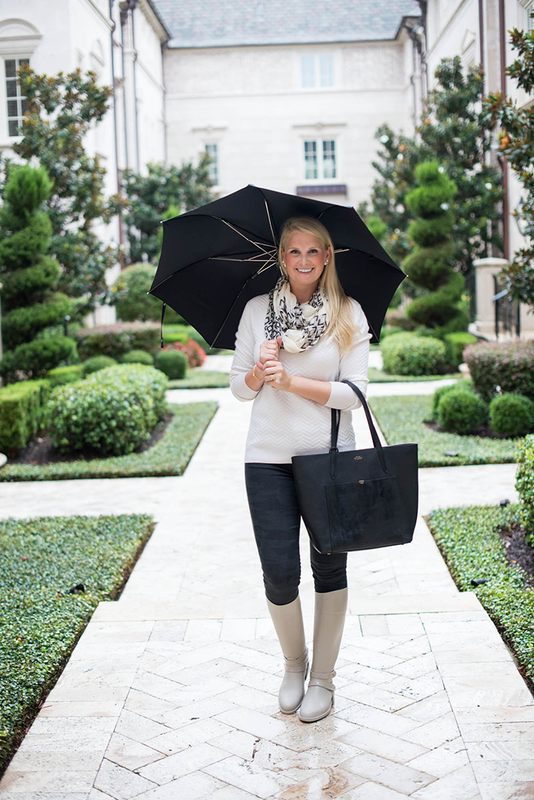 I love this look…people usually have darker rainboots, so these were an unexpected surprise (in a good way!). HUGE fan of the bag + sweater, too! Ha SVU is my obsession. You look adorable! It’s raining in Abilene as I type this, and I couldn’t be happier about it. Well, on second thought, I’d be happier if I was in laying in bed instead of at the office “working” but the rain has put a smile on my face, a rarity on Mondays. Hope you have a great week, Merritt! 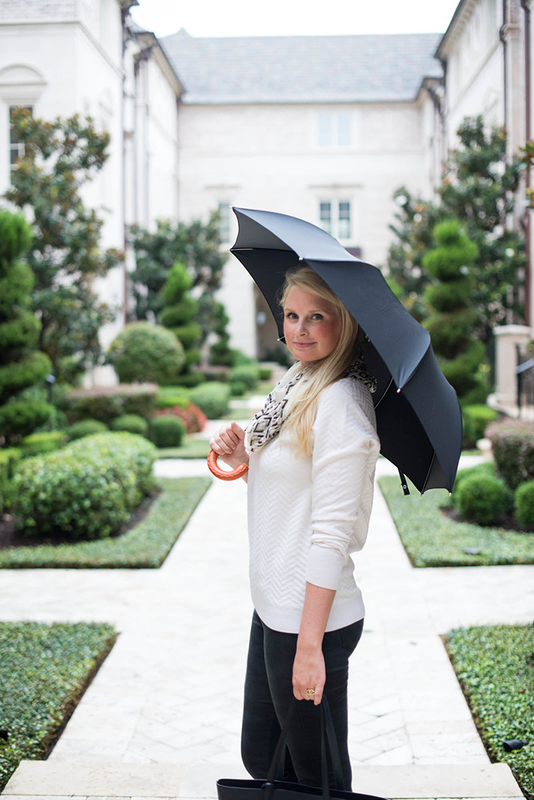 Really cute rainy day shoot!! That Chanel ring is perfection!!! Love the camo pants too!! A great alternative to basic denim!!! Happy Monday Merritt! Absolutely loving this look! That scarf is perfect with the sweater and those boots are gorgeous! Such a cozy outfit! I wish the cooler temps would stick around, I’m ready for Fall! I watched part of that SVU marathon yesterday also! I love all Law & Orders. Those pants are so cool with that subtle pattern. You look ready for fall! Love these jeans! Super cute fall look. Ohh those rain boots, how fabulous! I am right there with you about loving rainy days every once and a while. Last week we had two days of crazy rain..but I loved it. The perfect excuse to relax, watch some tv and take a few naps ;) James Jeans are some of my favorites..might have to add the coated ones to my wishlist! The perfect rain attire. Love the sweater and jeans. Those boots are adorable!! It’s getting ready to pour here in Houston. Wish it was Sunday so I could snuggle in bed instead of being behind my desk at work. Love this look! 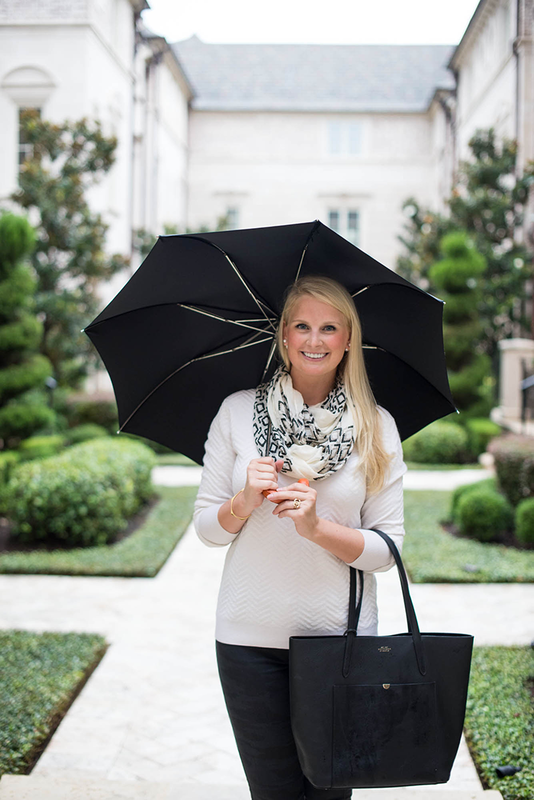 Black and white are a staple in my closet! Those rainboots are awesome! Love the color and style! Love those camo pants and that scarf! 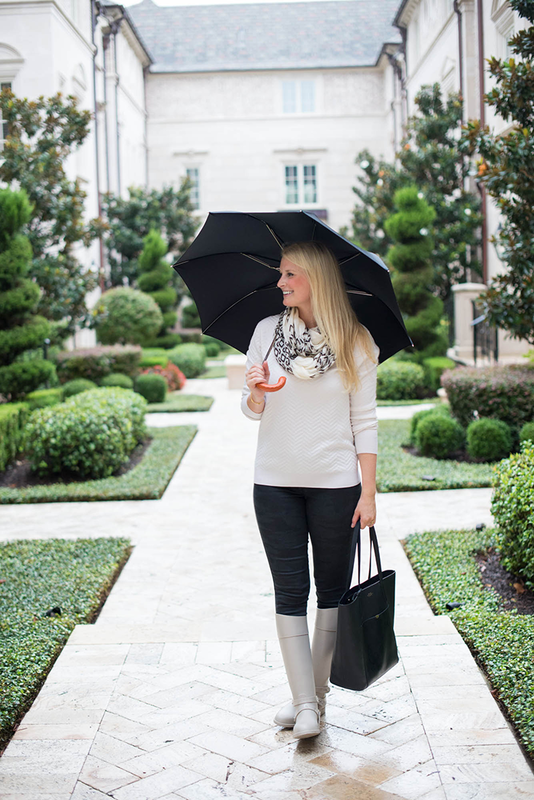 Great outfit for a rainy day! Those boots are soooo cute! I need to get a new pair of rain boots desperately! love the sweater and those boots are delish !! Love the combo of the sweater & scarf, can’t wait for fall clothes!